Ledger died while shooting Gilliam's "The Imaginarium of Doctor Parnassus"
Gilliam on Ledger, Monty Python and why filmmakers need "mule-like stupidity"
LONDON, England (CNN) -- Is there a filmmaker in the world with worse luck than Terry Gilliam? He was directing Heath Ledger in "The Imaginarium of Doctor Parnassus," when the actor died -- and it's not the first time he has lost a leading man. Is there a filmmaker in the world with worse luck than Terry Gilliam? Jean Rochefort didn't die eight years ago, but Gilliam had to abandon "The Man Who Killed Don Quixote" after a few days when 70-year-old star Rochefort became seriously ill and a flash flood washed away the entire set. The whole fiasco is captured in the documentary "Lost in La Mancha." But the animator-turned-director who made his name with the surreal opening sequences of "Monty Python" is also known for never giving up. He saved "Parnassus" by enlisting the help of Ledger's friends, among them Johnny Depp. He has even resurrected "Don Quixote," which will start shooting next year. The Screening Room talks to "The Fisher King" and "Brazil" director about Heath Ledger, the Ibiza Film Festival and why he'll never shake off the Monty Python label. The Screening Room: Heath Ledger's death during "Parnassus" was tragic, but how did you deal with losing your star in the middle of production? Terry Gilliam: I was just, it's like, now you've got to use your imagination because reality has bitten very hard. And, so, you call your friend Johnny [Depp] and say, "Heath just died. Can you help me?" And he says, "Fine, whatever. Whatever you need. I'll do it." That's how it started. Then I got Jude [Law] and Colin [Farrell], they came ... the point is that they were all friends of Heath, too. It had to be people that were close to him in order to do what we did. TSR: How do you feel about it now you've had some time to reflect? TG: The experience was awful. That's why we can laugh now. Making films is really hard, and this one was particularly hard. TSR: What is the most rewarding part of making films? TSR: You are a patron of the Ibiza Film Festival, which is only three years old. How did that come about? TG: The festival of Ibiza approached me a couple of years ago. John Hurt was already a patron, and I know John and I thought that it would be nice. I like being a patron of things, I like patronizing things. And if it's not going to be people, I'll patronize a festival. TSR: Why do you think film festivals are important? TG: The most important thing about them is you get to see films you would never get to see because the distribution system is so dominated by Hollywood. In every country, you get Hollywood movies plus local movies. Beyond that it's very hard. TSR: Tell us about how directing "Monty Python and the Holy Grail," your big feature directing break, came about? TG: With the success of "Python," we decided to make "Monty Python and the Holy Grail" and Terry Jones [fellow Monty Python member] and I said, "Anybody named Terry gets to direct the film," and the others foolishly agreed. We directed the film and our names went up as "directed by," and we were film directors. Bingo! Just like that. TSR: "Monty Python" was hugely successful, but is the downside that you'll never shake off the label of being an ex-Python? TG: Python is going to be stuck with me 'til I'm dead and probably afterwards. That's what's gonna be on the grave, as well. 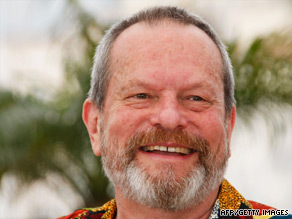 I know exactly what I'd like put on my gravestone: "Terry Gilliam. RIP and all that. He giggled in awe." TSR: What is your film philosophy? TG: All films are learning processes. I am still trying to work out how you make a movie. I didn't study at film school or any of those things. I didn't bother with film theory. Mine is the Mary Poppins theory of film -- a bit of sugar helps the medicine go down. And I have always got medicine I want to give to people. TSR: Which film are you most proud of? TG: "Brazil" is the one that will probably be stamped on my grave because that one seemed to have made a big effect on a lot of people. And that's all I'm trying to do is affect people. TSR: What have you learned over the 30-plus years you have been making films? TG: There is no one thing -- it's just going through life. I don't think you ever learn just one thing. At some point you start unlearning things. I have been working hard to unlearn everything I know. TSR: Where are you with "Don Quixote?" TG: "Quixote..." It's been almost eight years since it fell on its little face. We had been trying to get the script back from the legal entanglement it was in ... and finally pulled that off. I had in those intervening years never read the script because I knew it was the best thing I had ever written. It was perfect -- I finally did it. I got it back and re-read it and have now been busy rewriting it. TSR: What advice would you offer to aspiring filmmakers? TG: Talent is less important in filmmaking than patience. If you really want your films to say something that you hope is unique, then patience and stamina, thick skin and a kind of stupidity, a mule-like stupidity, is what you really need.